I'm so pleased to be able to share with you today some of the many beautiful projects from Improvising Tradition that are popping on social media. 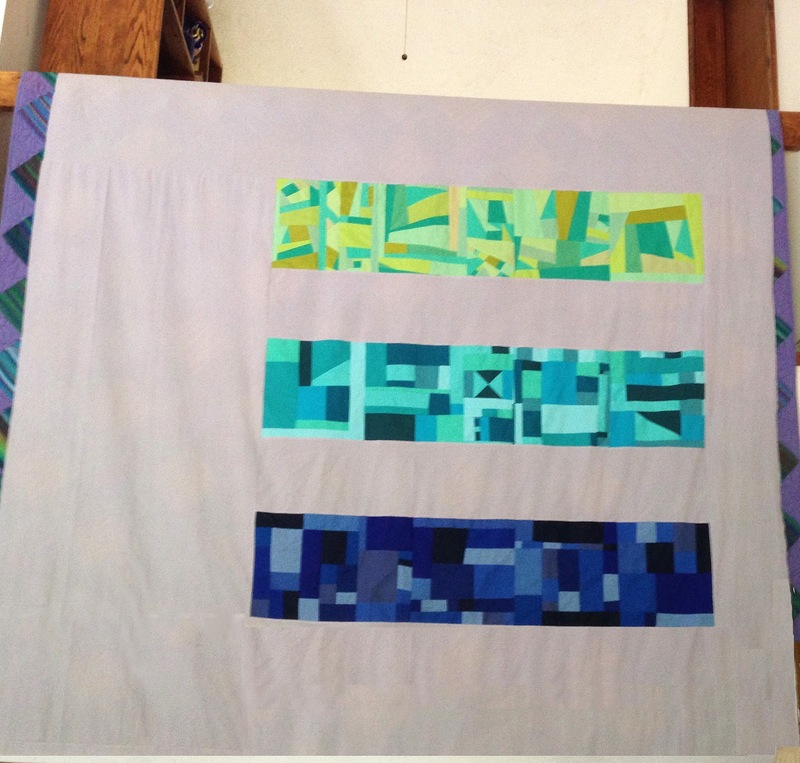 I was privileged to get to watch the creation of Nicole Ivey's Shattered Chevrons quilt each step of the way via Instagram (check out @purlverde for more of her gorgeous work), from fabric choice to quilting. I think her colors and fabrics are lovely; they are feminine with enough edge to suit the design. The herringbone quilting reinforces the design perfectly. I've already told her that I like her version better than my own! 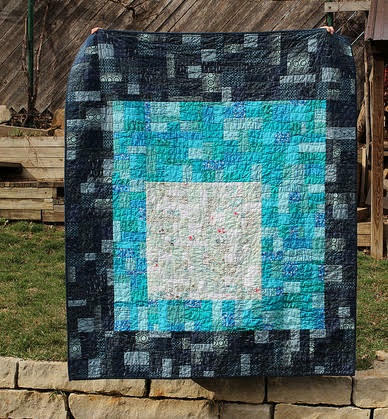 It is such a lovely quilt. Laurelle made this lovely table runner, based on the the Falling Leaves pattern. She even tackled the challenge of making her own template, which made me very proud. 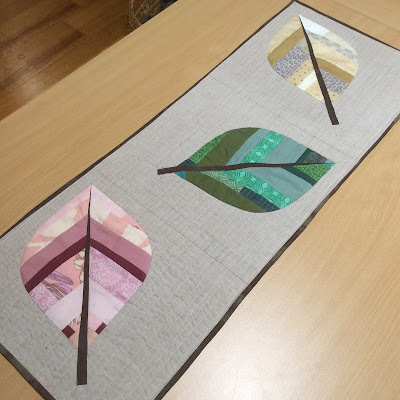 The technique explained in the book enables you to draft your own leaf template, a skill that can be adapted to a variety of curved piecing applications. Check out Laurelle's instagram account to see the fabric she was working to match, which makes the runner even more impressive. 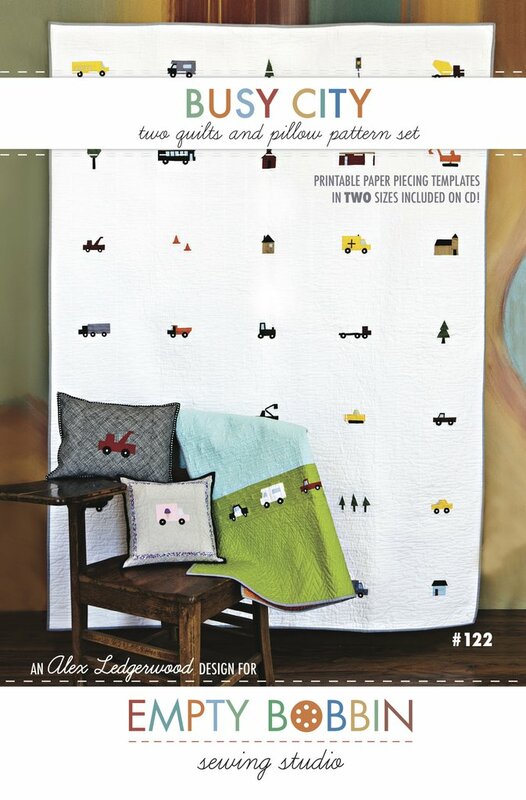 Nurdan Kulluk-Rennert of Hug a Bit Quilts made the prettiest Scattered Colors runner, and she cleverly created matching place mats. The gray solid really makes her bold colors stand out. Frequent commenter, constant encourager, and all around talented quilter, Debbie Jeske of A Quilter's Table took the inspiration of the En Pointe quilt and made her own version with the Pantone color of the year, Marsala. 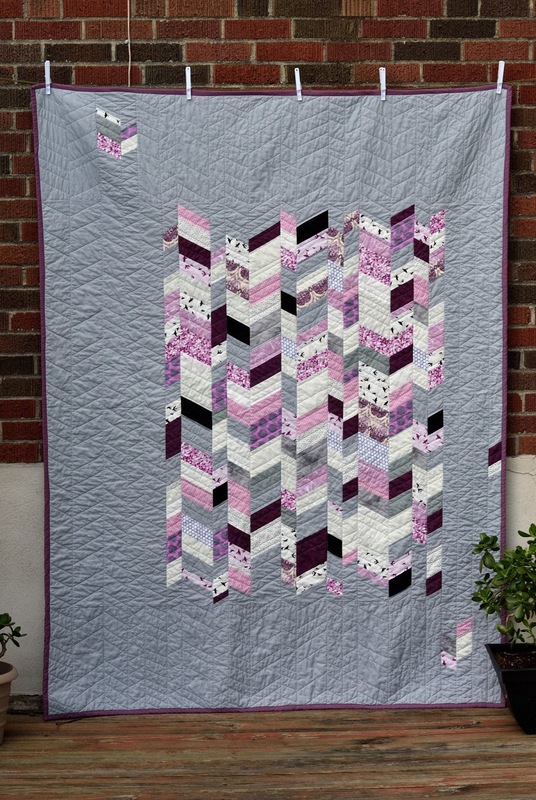 There was some amusement on Instagram over the bacon-like effect of the blocks, and she cleverly named the quilt Sizzling. My favorite elements of the quilt are all Debbie's: the asymmetrical layout, how one block engages the edge of the quilt including the binding, and the ghost block she created with quilting. It's just so good! 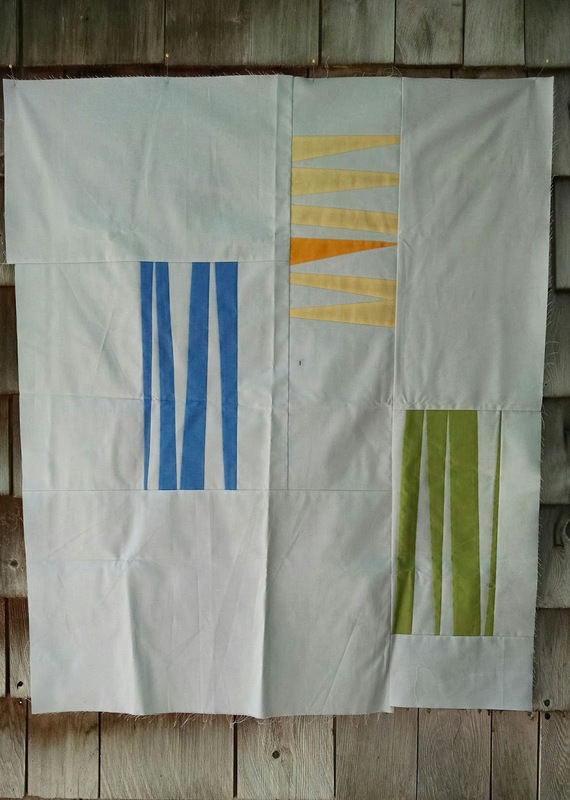 Lisa from Garden Gate Quilting also made a striking En Pointe wall hanging, and she shared one made by her friend Susie too. I love use of a print background for this design. It be really tricky to use larger scale prints as backgrounds because they tend to make seams really obvious, but this print is perfect. I found Sara Kidd's gorgeous Nesting Square quilt on flickr, and she kindly agreed to let me share it here. 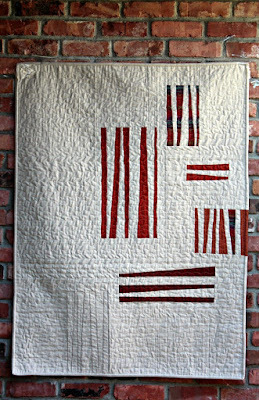 She varied the values in her strata a bit more than I did in mine, and I like how it makes the piecing more noticeable. I've linked to this on facebook before, but if you haven't read Kristi McDonough's review of Improvising Tradition, on her blog Schnitzel and Boo, you really should. 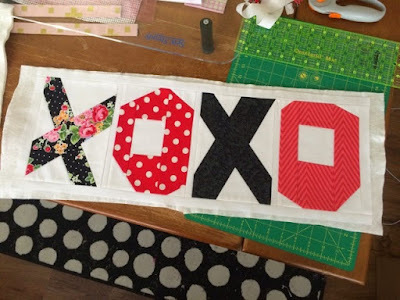 It's honest and funny, and I love her mini quilt based on the XOXO baby quilt. Red and black are not colors I would have chosen, and aren't they cute? 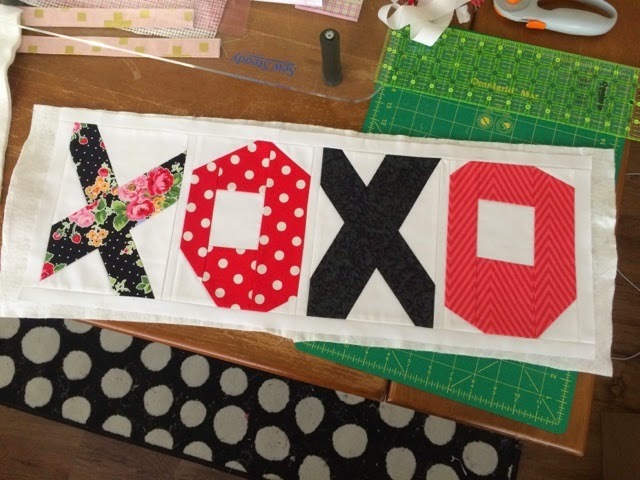 The fabrics fit the "love" theme so well. 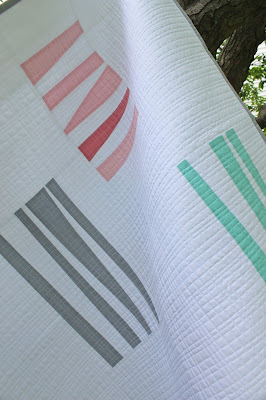 Pam Lincoln of MamaSpark blogged about her collaborative version of the Waterfall quilt. 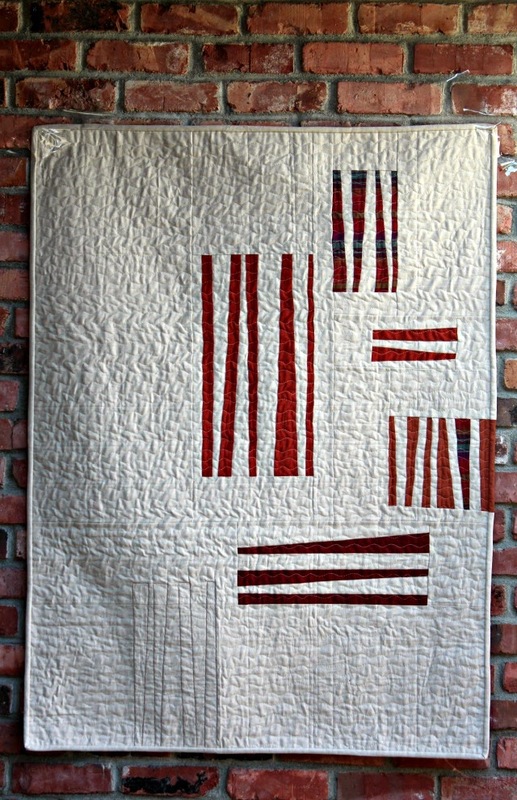 She and two friends, Judith and Robin, each made a strata strip in a different color and joined them to make this improv beauty. 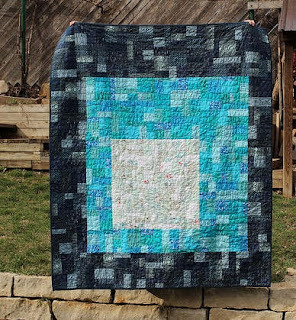 Making a large quilt with friends is such a good idea, and a quilt like this is the perfect way to do that. 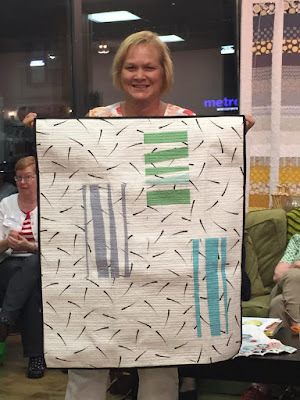 Thank you so much to these talented quilters for allowing me to share their work here on the blog! As a designer and writer, there is nothing more fulfilling and flattering than begin able to see what someone has made, based on what I created. The solitary activity of making and writing creates a social connection and a shared endeavor in some small way. It's the best! I'd love to see what you make, and I will save your photos and links for another post. Contact me via any of the social media platforms (links on the right sidebar), or send me an email. En Pointe is a wall hanging from the Slice and Insert section of Improvising Tradition . The technique is quite simple. Slice a rectangle of a desired color and insert strips of your background fabric. 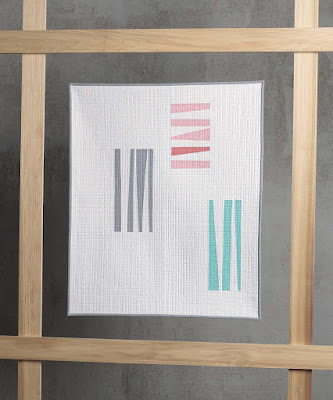 In the book, I teach you how to insert the strips at angles, creating a really unique block that appears to float when set asymmetrically into the background. 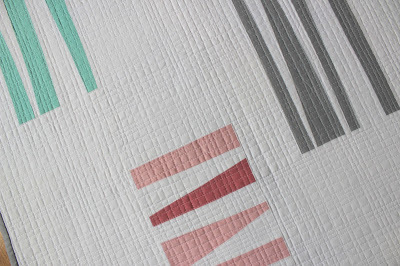 The color scheme of the quilt was inspired by the dusty pastels of Degas' ballerina paintings, which in turn inspired the name. The pink block makes me think of an abstract laced point shoe. 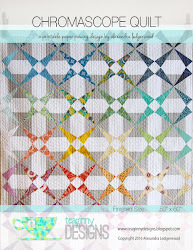 You may recognize the design from a similar quilt I made a few years ago called Flashdance. Color makes such a difference in design. 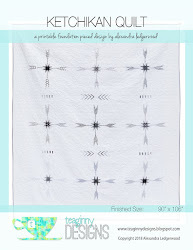 The quilt would look completely different with a dark background and monochromatic, neutral slices. As always, I'd love to see what you make! You can reach me on just about every social media platform (links on the right side of the blog) or send me an email with a photo. I'm working on a post featuring projects made from the book.